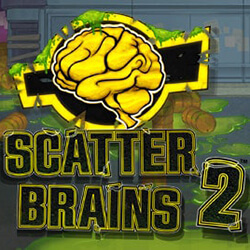 Scatter Brains 2 is a zombie themed pokie developed by beloved software creators Playtech, and features enough undead action to rival The Walking Dead, along with a number of bonus features. This zombie-themed title is fairly unique in its appearance, and thanks to fast-paced gameplay, the pokie should prove to be popular for most players. The pokie is set on 5×3 reels, with 243 combinations that can potentially be landed across the reels. The standard scatters and wilds are also present, as well as free spins, roaming wilds, and 3x multipliers. Bets can start low, but taking into account the 3x multiplier, and the player’s initial stake can increase exponentially. In terms of wilds, the Biohazard Symbol is the icon to look out for, which can appear on any of the reels and acts as a substitute for incomplete combinations. Scatters come in the form of the game’s logo, and both pay out to the player and trigger the free spins bonus, as long as there are at least three of them on the middle reels. Once triggered, the player will receive five free spins, and all scatters on the reels become Zombie wilds with 3x multipliers. The pokie’s roaming wilds can turn normal symbols into extra wilds if landed upon. If a Zombie wild makes contact with a character symbol, a Respin will automatically trigger, and the wilds will then take the place of those characters for the rest of the round.